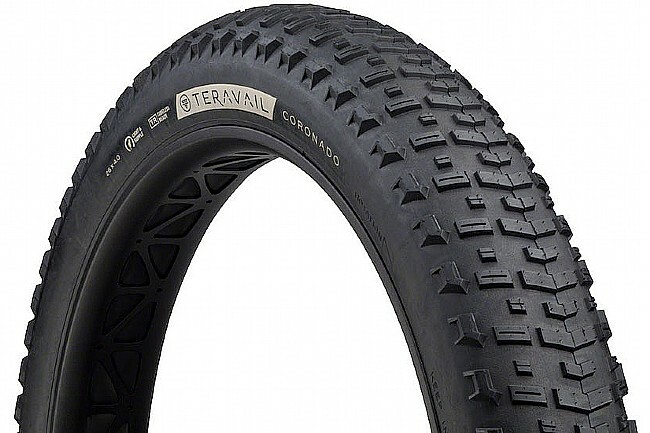 The Teravail Coronado MTB Tire is an extra-wide all-rounder designed to suit it all. From the dry, vast deserts that cover the Southwest to the seemingly endless stretches of beach running up the Pacific Northwest coast, the Coronado was designed to excel in terrain where sand would normally be a hindrance and increased floatation is critical. The 26 x 4.0 Coronado is designed specifically for summer riding in loose terrain. A mild and open center tread works with the slightly more aggressive side knobs to offer traction and efficiency in sandy terrain. Mount them on a 65mm rim for a faster rolling tire or 80mm maximum flotation. Choose the standard casing for added puncture protection and durability, however if that's not necessary turn to the Light & Supple Casing. Offering decreased weight and added comfort, this ultra-supple casing improves the ride quality at lower pressure when set up tubeless.